The goal of the divestment movement is to pressure institutions, including universities, to sell investments in the oil, gas, and coal industries, with the ultimate goal of eliminating all fossil fuels. If divestment activists were to succeed in their efforts, the result would be to keep billions of people in poverty, denying them access to electricity and to lifesaving products like steel and pharmaceuticals that come from fossil fuels. Divesting from fossil fuels would amount to divesting from modern life. Fortunately, and despite the fact that divestment activists have grown louder, a mere 0.24 percent of colleges and universities worldwide have divested from fossil fuels, according to the NAS report. 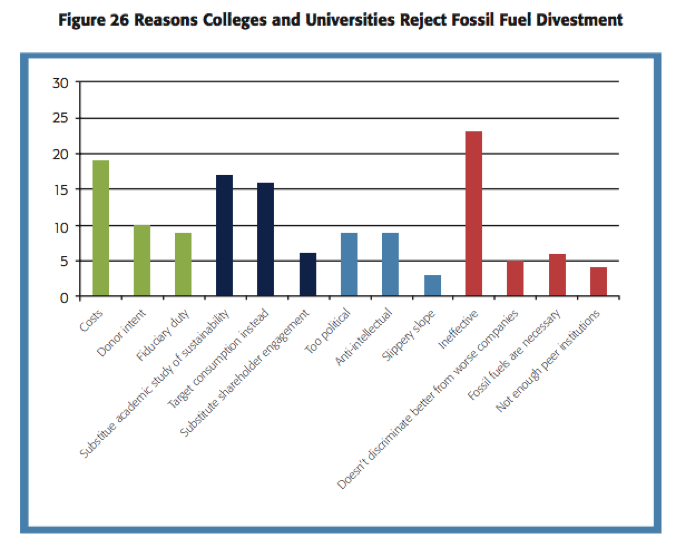 Moreover, only 34 percent of “divested” colleges and universities have fully shed their fossil fuel investments—NAS calls these colleges DINOs (divestment in name only). First, every American is a prolific fossil-fuel user, and substitutes (ethanol for gasoline, wind/solar for electricity) are limited, expensive, unreliable options. Second, many—if not most—Americans are rewardingly invested in the oil, gas, coal, and electricity industries. Third, profit-seeking investors can be expected to buy as fringe emotional investors sell, leaving stock prices unchanged. As a result, at least thirty-five American colleges and universities who have been pressured have declined to divest. According to formal statements issued by twenty-nine of these institutions, the single most popular reason they chose to reject divestment was its ineffectiveness at improving the environment, followed by the high costs of divesting. Even the divestment advocates themselves acknowledge that divesting from fossil fuels will not decrease the share prices of fossil fuel companies or shrink their profits. And yet, activists continue to escalate their efforts, encouraging a generation of students to reject intellectual integrity and give in to environmentalist groupthink. 350.org, the organization that brought the campaign to national prominence, pays and trains students for activism and schedules campus protests. “The divestment movement is astroturf,” said [NAS Director of Research Projects Rachelle] Peterson. The divestment movement is morally bankrupt. As we continue to point out, eliminating fossil fuels would consign billions of people to poverty and darkness. Divestment also hurts poor students by leaving universities with less money to spend on need-based financial aid. If left unchecked, this immoral attack on human development will continue to invade colleges and universities across America, undermining intellectual integrity and promoting policies that hurt the poorest among us.